I love seasonal decorations, just a few hints here and there around the home. Sure, I guess if you’ve got kids you’ve got a better excuse than me, but I just think it’s really cute and fun and a great way to mix up how your home usually looks. 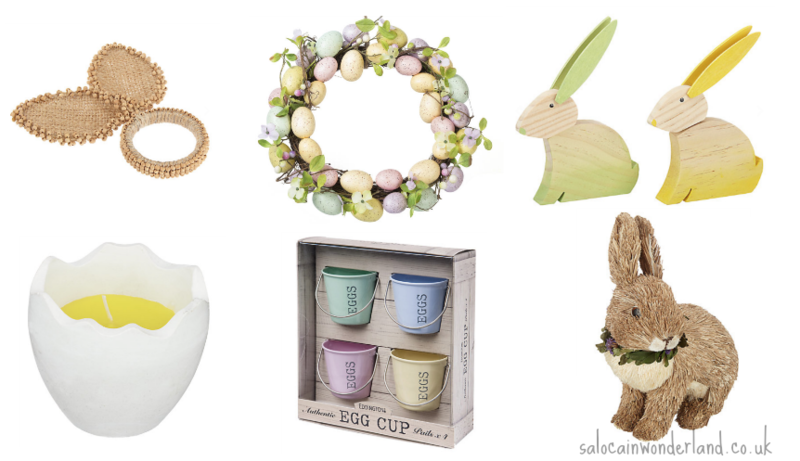 Most of the Easter decorations are geared towards households with tiny chocolate covered hands, but I did manage to find a few cute, maybe slightly more grown-up, understated Easter decor pieces. Just a touch of fun to your Easter table when the family come around on Sunday for their roast dinner. These little napkin rings are too cute and very understated if you haven’t got much else in the way of Easter on your table, apart from the mini egg that got away. Seasonal wreaths are too cute, thought I wouldn’t be looking to put it on the front door, I don’t trust this weather, it would look really cute on a living room door or hung on the wall in an alcove or above a side unit. The pastel colours are not garish and it isn’t covered in fluffy illumines yellow chicks that look like something of juniors easter bonnet competition. Small, ridiculously inexpensive and cute, you could easily pop one on a bookshelf for a very discreet homage to the Easter Bunny himself. I really like the idea of putting them in a less than obvious place, especially if you don’t want to make it obvious you're decorating for Easter, it seems like a more ‘natural’ decoration, if that makes any sense at all! Fun, fun, fun, again, a few of these dotted around the coffee table, on bookshelves, windowsills etc, are just a quirky and fun addition to your easter decor. You could easily reuse the egg shells next season and just pop in a yellow coloured votive candle. Personally, I’d use these all year round, just look at the mini pails with their little handles, can we all say cute? I love them, they’d be a great addition to the Easter morning breakfast, filled with runny eggs and served with lots of soldiers for dipping. Ok, now I’m hungry. I had something similar to this years ago but it was a bear and it was adorable. Ok, it’s a little obviously easter decor but for the price, I’d say it’s reasonable and these things tend to wear well over time as long as tiny hands and paws are kept at bay. How cute would this little guy look chilling on the bottom stair or in the porch? Now, it's time to go eat another hot cross bun! So cute! I want a nice house so I can actually decorate it haha.